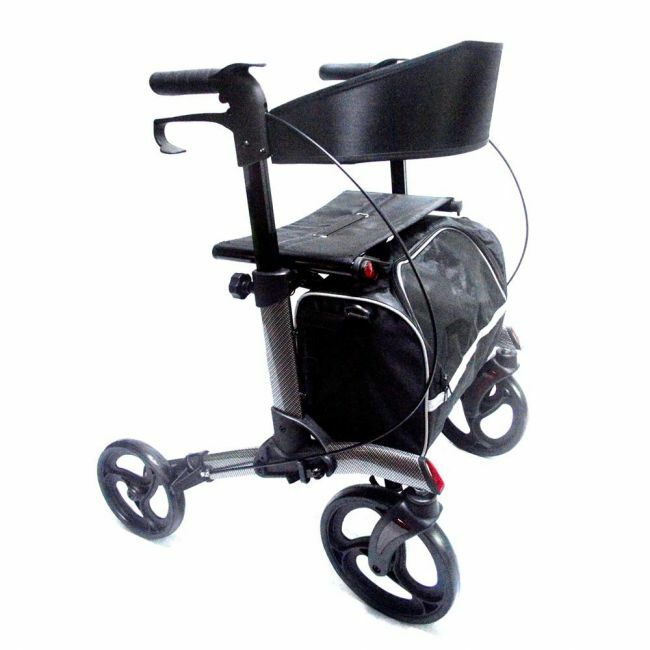 The Elite Care Swift rollator folds side to side like some other models do but it then folds downwards to a compact unit by simply releasing 2 quick release catches on the frame. X shaped folding mechanism so the walker folds flat yet can still be stood upright unlike other models. Comes as standard with a shopping bag which hooks on the front. This easy to fold compact lightweight rollator will fold up easily without the need to remove parts. It will fold up with the bag still on it as long as the bag is empty. Height - 83cm / 32.5" to 93cm - 36.5"
Depth - 65cm / 25.5"
Folded Height: 86cm / 33.9" - 97cm / 38.2"
Folded Width: 25cm / 9.8"
Folded Length: 74cm / 29.1"
Folded Height - 36cm / 14"
Folded Width - 28cm / 11"
Folded Length - 91cm / 36"
Seat Height - 60cm / 23.5"
Seat Width - 45cm / 18"
Seat Depth - 20cm / 8"